Cardington FFA officers for 2019-2020 are, front row, from left: Hazel Jolliff, Cheyenne Skaggs, Alexis Brook-Hobbs, Mikaela Osborne and Brooke Clapham. Back row: Isabelle Crum, Liam Warren, Brydon Ratliff, Grace Struck, Tess Ruehrmund, Camrie Meyers. Pictured are the honorary degree winners named at the Cardington FFA banquet. From left: Matt Clinger, Dan Ebert, Heather Clapham and standing in for Devon Heacock is Lynn Goodman. Pictured are the Star Members from each grade awarded during the Cardington FFA banquet. Shown, from left: Tess Ruehrmund, (10th); Brooke Clapham (9th); Jacob Levering (11th) ; Delisa Goodman (12th) and Audrey Brininger (8th). 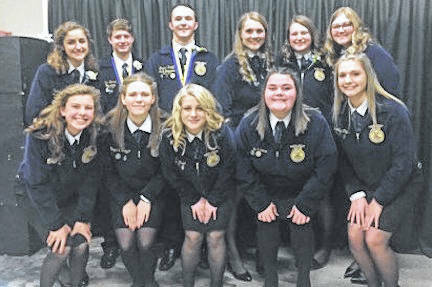 Celebrating its 80th annual spring banquet were 575 members and guests of the Cardington FFA on Friday, April 5. The dinner, held in the Murphy Gymnasium. was served by All Occasions Catering, Waldo. The group then moved to the Patrick Drouhard Auditorium where awards and recognitions were made by Erin Wollett, the chapter teacher/advisor. Named recipient of the Star Discovery was Aubrey Brininger; Star Greenhand: Blake Clapham; Star Chapter Farmer: Tess Ruehrmund; Outstanding Junior: Jacob Levering, Outstanding Senior: Delissa Goodman; High Point Member: Levering; Reserve High Point Member: Delisa Goodman; and recipient of the 110 percent award was Camrie Meyers. Molly Clinger presented the McGinnis Family Scholarship to Aubrey Curtis; Matt Clinger presented the Farm Association Scholarship to Delisa Goodman and Gabriella Snodgrass; and the FFA Farm Alumni Scholarship was awarded by Betty Brandum and Lisa Levering to Delisa Goodman and Aubrey Curtis. Brandum presented the Junior Brandum Memorial Scholarship to Delisa Goodman. 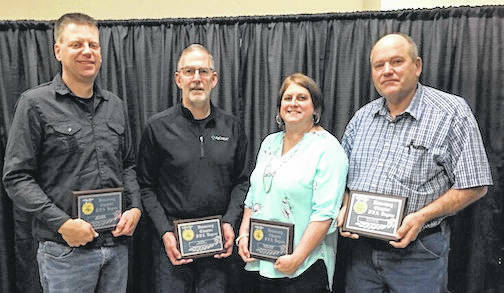 Named honorary FFA members were Matthew Clinger, Heather Clapham, Dan Ebert and Devon Heacock. Top fruit sales person was Delisa Goodman, who sold $3,072 worth of fruit, nuts and cheese. Second place in fruit sales went to Michael Rose; third place, Sydnie Wilson; fourth place Chelsey Miller and fifth place winner was Brooke Clapham. Each sold over $1,000 worth of fruit. The chapter sold a total of $38,000 in the fruit and nut sale Goodman was the top strawberry salesperson selling $1,119 worth of the berries. The chapter sold a gross amount of $7,397.00 in strawberry sales. There are 121 members in the Cardington FFA Chapter including 21 seniors. The chapter’s 2019 successes include being a top 10 chapter in Ohio; a state gold rated chapter, a top 10 state Premier Chapter in the area of growing leaders and a top 10 state Premier chapter in the area of building communities. The students include eight state degree; and five American degree recipients; seven proficiency award applications; one state proficiency finalist and three state gold rated officers. For the 19th year, dating back to 1991, the Cardington FFA has been named one of the top 200 best chapter in the nation. Giving their retirement messages were vice president Dylan Goodman and his sister, chapter president Delisa Goodman. New officers installed for 2019-2020 were Liam Warren, president; Brydon Ratliff, vice president; Camrie Meyers, secretary; Alexis Brook-Hobbs; assistant secretary; Grace Struck, treasurer; Mikaela Osborne, assistant treasurer; Tess Ruehrmund, reporter; Brooke Clapham, assistant reporter; Cheyenne Skaggs, Sentinel; Isabelle Crum, student advisor and Hazel Jolliff, Chaplain.